While I haven't had time to keep up on blogging this find by Ariel over on Blogs of Zion is a gem. The sad truth is that it's probably pretty close to accurate. Lots more on the media war against Israel coming soon. "The most likely explanation is that there is some scripting on the site that, although not malicious, triggers an alert from Symantec's firewall software," said Carole Theriault, senior security consultant at UK-based net security firm Sophos. "It is possible that malicious content has once been on the site, but has since been removed. It is also theoretically possible, though very unlikely in our opinion, that the malicious content targeted visitors from an Israeli address," she added. So, it could have been there and been removed from the site or else hidden in code she can't find from the U.K. Not a convincing argument that it's all a hoax, is it? I have lots of family and friends in Israel, including one information security expert, so I did check it out. Yep, the code was there. Is it still there? Nope. Was this real? Yep. Was it removed once this story spread across the blogosphere? Yep. FWIW, I doubt the madman of Iran is computer savvy enough to have done it for himself. FWIW, I am writing this from a computer running Ehad Linux and the Hebrew version of Firefox 1.5.0.6. Iranian President Mahmoud Ahmadenijad now has his very own blog. That's fine. The content is entirely what you might expect with one notable exception. Several Israeli bloggers, including Yael K.'s Step By Step, which I read regularly, report that if you access the Ahmadenijad blog from an Israeli IP address the site sends you a little gift, a cyberattack in the form of a virus or trojan (reports vary) designed to exploit an Internet Explorer vulnerability. Does Iran now use the Internet to harass Israeli citizens? To take advantage of the increasing Iranian-Israeli dialog online? In a word: yep. The attack is smart enough to mostly ignore IP addresses from anywhere other than Israel, though it has been reported to have been triggered from Spain as well. My one little piece of advice for friends and readers in Israel: Ehad Linux, an Israeli Linux distribution based on Mandriva 2006, is really quite easy to install and use. (Yes, I plan to write a review.) Those of us who run Linux have been blissfully immune to all the security nonsense which routinely plagues Windows users. No, installing Linux is not a security panacea. You still need to patch regularly and become educated about keeping your system secure. It is, however, a very good start. Unfortunately, there will be another round [in this war] because the government's just demands weren't met. The [kidnapped] soldiers weren't returned home, the Hizbullah was not disarmed. Right now, we are in an interim period between wars, and there is no one who will prevent our enemies from rearmed and preparing for the next round. We were a responsible opposition. We aided in every way, including in the media war. Our public duty is to tell the truth, because unfortunately there will be another round. We were living in a coma, and received an alarm warning telling us to return to reality as it is, and to return to ourselves and to those values that will secure our existence in the future. These words are excerpted from former Prime Minister and opposition leader Binyamin Netanyahu's speech to the Knesset plenum (in translation) as reported by The Jerusalem Post. Sadly, he is absolutely correct. Without the return of Israel's kidnapped soldiers, as called for in UN Resolution 1701, and without the disarming or Hizbullah, the acceptance of the resolution and the cease fire it called for were a major mistake. The United Nations has never, ever been trustworthy and has always sided with Israel's enemies. Why should anyone think this has changed? The Latest Israeli Attack On Beirut? Hey, it's every bit as real as the stuff Reuters publishes which ends up in your local newspaper. Heck, if anything this piece of fauxtography is more creative than what Reuters used and every bit as believable. OK, it's a fake. As other blogs have pointed out there is no Star of David on the Enterprise so it can't be real. Photographer Lenny Maschkowski has been taking pictures all over the Haifa area right after every rocket attack, sending them out in PowerPoint presentations which circulate among Israelis all over the world. I've been receiving them from one of my cousins in Israel. 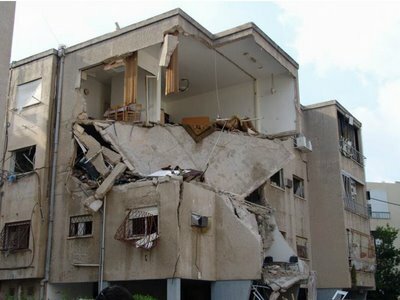 Just to give you an idea of the devastation caused by the various rocket that have landed in and around Haifa, and of their deadly load. These are the kind of things that Israel should leave unanswered, if we are to believe many European leaders and officials. I think not, and I think this illustrates perfectly well why Hizbullah must never be allowed to rearm and redeploy along the border no matter what anyone in the so-called world community or the media might say. Meanwhile the Israeli daily Yediot Ahranot reports that Israeli casualties and losses often go unreported, especially in the British media. Their report is especially critical of The Guardian and the BBC. I guess those two were too busy fabricating stories about Israel massacring Lebanese civilians. No wonder so many people in the U.K. have such an incredibly distorted view of the Middle East. Yesterday it was widely reported that Israel deliberately massacred 40 innocent Lebanese civilians. Reuters, the BBC, and others falsely reported that the IAF hat targeted a funeral procession. Then it was 40 Lebanese killed in air strikes. The only place you'll still find that reported is in The Guardian. No other even vaguely reputable western media outlet still carries the story. Why? The total number of people actually killed in Lebanon by these attacks: just one. Even the BBC eventually corrected their story, with a small note at the bottom noting the previous error. Reuters published an apology. That won't undo the damage done but at least they don't maintain a blatant lie on their website the way The Guardian does. And how about those 40 people killed in a deliberate Israeli massacre yesterday, hmmm? Oh, ooops, you mean it was really only 1? And amazingly, from my own observation of the BBC yesterday to see how this would be handled since they had a screaming headline about the massacre of 40 civilians --it took them several hours after the ticker on Ha'Aretz was showing that the number had been revised to just one person for them to change it. And no, of course they didn't make it a headline: the 40 massacred headline got changed to Israel bombs...and in the text description beneath there was a little note that it was one person and not 40 as previously reported. Of course. The BBC is notorious for anti-Israel bias, but The Guardian wins today's "to hell with the truth" award, beating out CNN and The Washington Post for having the least regard for facts. When charges were made that Hizbullah was deliberately using civilian casualties for PR purposes at Qana the charge came from Lebanese sources and even from members of the Lebanese armed forces. That charge was backed up with lots and lots of evidence. Do mainstream media outlets like CNN and The Washington Post investigate these charges? Heck, no! They are too busy vilifying Israel to be bothered with something as petty and trivial as the truth. Their response: make the same charge about Israel with no evidence whatsoever. First a CNN anchor claimed Israel could shoot down all of the 150-200 Katyusha rockets fired by Hizubullah each day. Now Washington Post reporter Thomas Ricks, appearing on CNN, claimed Israel is deliberately leaving Hizbullah rocket launchers intact to kill Israeli civilians for PR purposes. Video is available in this article, which is definitely recommended reading. One wonders who these "military analysts" are and why they have apparently not gone on the record. And why has Ricks so far not written the story in the Post? Can it be that his claims are too much even for the Washington Post to publish? Whatever the reason, the fact is that a reporter who thinks that Israel would intentionally allow Hezbollah's Katyushas to rain down on Israeli civilians would believe anything about Israel, no matter how monstrous or unfounded. And any reporter who believes that reserve Israeli soldiers would follow orders to not attack rockets that are aimed at their children and wives, and that these soldiers would not immediately go to the Israeli media with the story, is an idiot. Furthermore, Israel encouraged its civilians to leave the danger zones, which is why thousands of Hezbollah rockets have killed relatively few civilians. If Israel cynically wants its civilians to die, why would Israel do all it could to get its civilians out of harm's way? How can anyone believe that CNN is a reputable news sources? It seems to me that their bias is now so extreme that they do little if anything to hide it. If Mr. Ricks remains a reporter with The Washington Post that would speak volumes about their regard, or lack thereof, for the truth. If you read, watch, or listen to news reports about casualties in Lebanon you always learn about innocent civilians killed. They are poor farmers or villagers. All the victims in the war seem to be civilians even though Israel only targets Hizbullah strongholds and sites were rocket fire originates. Tell me this: how can you tell that all these people are civilians? Hizbullah fighters don't wear uniforms, do they? Of course they don't. They're not a regular army. So... some, possibly many of these "civilians", at least among the Shiite Muslims killed or injured, are actually Hizbullah. Human Rights Watch, which routinely accuses Israel of war crimes while holding Hizbullah blameless, now puts the death toll at Qana at 28, not the 56 still being claimed by the Lebanese and Arab press. Some media outlets have reduced their casualty counts but most simply moved on. It seems that reporting that the original number killed was inflated is not newsworthy. The International Committee of the Red Cross (ICRC), hardly a friend of Israel, has agreed to look into claims that Qana was staged by Hizbullah. Reuters has admitted using doctored photographs, both from Beirut and Qana. Bottom line: lots of media bias, lots of inflated casualty numbers, and many of those dead civilians in Lebanon aren't civilians at all. The Qana tragedy has intensified accusation that Israel's actions in Lebanon violate international law. . . . but there is no evidence Israel has committed any war crimes. In contrast, Hezbollah, Iran and Syria have clearly violated international law . . .
restriction . . . involves a complicated and controversial balancing test . . . governed by 'customary international law', it [hinges] on the intent of the combatant. At Qana, . . . the aircraft did not deliberately target civilians; but Hezbollah rockets are targeted at civilians, a clear war crime. . . . If Hezbollah used Lebanese civilians in Qana as human shields, the Hezbollah not Israel, is legally responsible for their deaths. . . . Hezbollah and Iran--which provides this terrorist group with arms, direction and over $100 million a year--are in continual violation of international law. Their calls for Israel's destruction violate the international genocide treaty's prohibition of 'direct and public incitement to commit genocide.' . . .
Israel is acting in self-defense . . . the track record of many Israel's most powerful accusers--including China, Russia and the European Union--is not nearly as good at balancing civilian risk against military goals. . . . Compared with how China, Russia and the EU have dealt with non-existential threats . . .Israel's responses to the threats of its existence have been remarkably restrained rather than disproportionately violent. It seems that there are two standards of international law among Israel's accusers at the U.N. and elsewhere: one for Israel and one for everyone else. Alas…they discovered, and it was too late when they did, they discovered that those men who were supposed to protect them, were in fact hiding behind them. Pray tell me, were you counting on the public outcry to force the Israelis into a cease fire and thus claim your victory??? Like what happened in April 1996??? Is this what you were aiming at when you fired rockets from the vicinity of the UN post not three days ago, causing a retaliation that killed four UN soldiers??? The thing is that it didn't work for Hizbullah. Not at all. There is no cease fire and now the truth is coming out. This also strongly reinforces Alan Dershowitz' claim that Hizbullah actually wants massive Lebanese casualties for propaganda purposes. Huge thanks to Yael K. who made me aware of this. The Ouwet Front is a blog which describes itself as "Personal Views and Opinions of Lebanese Forces Members". They've had lots to say about Qana, and none of it is at all kind to Hizbullah. They, in fact, blame Hizbullah for the deaths at Qana rather directly. May Hezbollah and Nasrallah rot in hell for what they are doing. If Israelis were war criminals, Hezbollah are ruthless killers. They once again provide a link to video proving their point. We strongly condemn the Israeli attacks on Lebanon, we strongly condemn any invasion against our country or interference in our internal affairs BUT we cannot tolerate a LEBANESE party using innocent Lebanese civilians as human shields for purposes that only serve terrorist countries like Iran and Syria. I don't feel Israel has any choice when it comes to attacking Israel. I will be posting photographic evidence of why very shortly. In any case if Hizbullah had not attacked Israel in the first place and if they did not persist in these attacks right up until the present there wouldn't any need for Israeli military action in Lebanon. Who Is Really Responsible For the Carnage At Qana? Ajoutant : « ils ont utilise Cana qui a déjà été un symbole d’un massacre d’innocents, ils ont fomenté un Cana 2 ». "We have it from a credible source that Hizbullah, alarmed by Siniora's plan, has concocted an incident that would help thwart the negotiations. Knowing full well that Israel will not hesitate to bombard civilian targets, Hizbullah gunmen placed a rocket launcher on the roof in Qana and brought disabled children inside, in a bid to provoke a response by the Israeli Air Force. In this way, they were planning to take advantage of the death of innocents and curtail the negotiation initiative," the site stated. The site's editors also claimed that not only did Hizbullah stage the event, but that it also chose Qana for a specific reason: "They used Qana because the village had already turned into a symbol for massacring innocent civilians, and so they set up 'Qana 2'." Notably, the incident has indeed been dubbed "The second Qana massacre" by the Arab media. Shocking? Shouldn't be. Any one who is willing to strap bomb-vests upon their children and send them to their deaths is a true believer. And Qana was simply Martyrdom by other means.